Financial Services – Latest Venture news. Cashfree, an India-based startup that specializes in making corporate banking services more accessible and easier to use, has closed a $5.5 million Series A round. The deal is led by Smilegate Investment — the fund affiliated with Korean games firm Smilegate — with participation from Y Combinator, the U.S. accelerator program that Cashfree graduated from in 2017. The startup previously raised an undisclosed seed round from investors that include former UK Finance Minister George Osborne, and Vellayan Subbiah, who was previously managing director of Cholamandalam Investment, both of whom joined this new round. Founded in 2015 by Reeju Datta and Akash Sinha, Cashfree started out as a payment gateway before it pivoted to tackle the more pertinent issue of moving money in India. Today, its service is used by more than 12,000 businesses to disperse bulk transfers for things like vendor payments, wages, reimbursements, refunds, and more. Those customers include recognizable names like Xiaomi, Tencent, Zomato, Cred, Club Factory, ExxonMobil and Dunzo, the concierge service backed by Google. “While developing the payment gateway, we realized there are a lot of problems operating corporate bank accounts in India, especially when you have to handle a lot of transfers on a daily basis,” Datta told TechCrunch in an interview. Cashfree helps its customers to connect their corporate banking services via a single interface. Aside from enabling disbursements to bank accounts, via India’s UPI system or to wallet accounts like Paytm, the system allows analysis, such as calculating top vendors, aggregate payouts and other business intelligence that would take hours of manual work using corporate bank services. Datta said the company currently processes $4.5 billion annual recurring volume. That’s not take-home revenue — Cashfree makes its money on a per transaction basis — but he said it is profitable and has been since it graduated YC 18 months ago. The current thesis is to work with banks rather than against them, Datta explained, but there’s always the potential that Cashfree itself might offer banking services. Right now, that isn’t possible — Datta said Cashfree will need to “wait for the regulatory climate to clear up” — but it isn’t beyond the scope of possibility that it could emerge as a challenger bank in the future. Beyond clearer regulation, “a couple more fundraises” might be necessary for that evolution, the Cashfree co-founder added. Still, Cashfree will use this new money to double down on its banking services — those that attached to banks, that is — with a new solution with increased integrations set to ship to customers soon. It is also building up its presence in Delhi and Bombay, where it has begun hiring business development teams to expand its work. 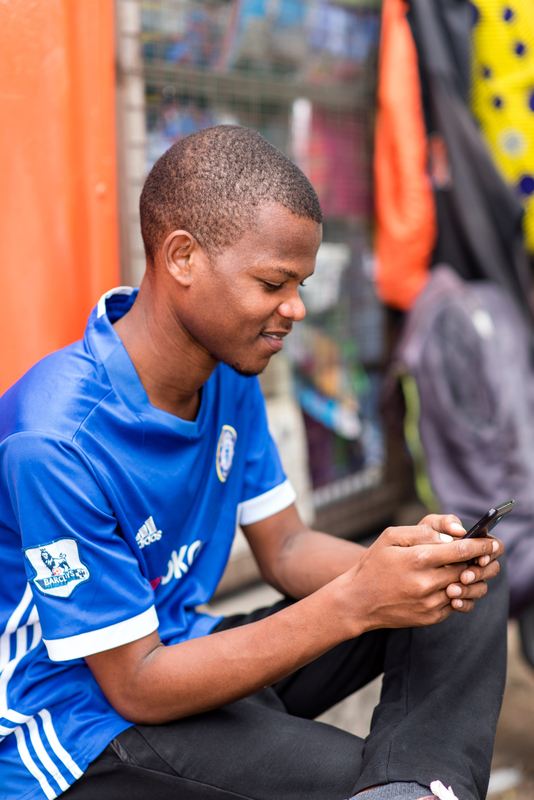 The San Francisco-based startup Branch International, which makes small personal loans in emerging markets, has raised $170 million and announced a partnership with Visa to offer virtual, pre-paid debit cards to Branch client networks in Africa, South-Asia and Latin America. Branch — which has 150 employees in San Francisco, Lagos, Nairobi, Mexico City and Mumbai — makes loans starting at $2 to individuals in emerging and frontier markets. The company also uses an algorithmic model to determine credit worthiness, build credit profiles and offer liquidity via mobile phones. “We’ll use [the money] to deepen existing business in Africa. Later this year we’ll announce high-yield savings accounts…in Africa,” says Branch co-founder and chief executive Matt Flannery. The $170 million round from Foundation Capital and its new debit card partner, Visa, will support Branch’s international expansion, which could include Brazil and Indonesia, according to Flannery. Branch launched in Mexico and India within the last year. In Africa, it offers its services in Kenya, Nigeria and Tanzania. The Branch-Visa partnership will allow individuals to obtain virtual Visa accounts with which to create accounts on Branch’s app. This gives Branch larger reach in countries such as Nigeria — Africa’s most populous country with 190 million people — where cards have factored more prominently than mobile money in connecting unbanked and underbanked populations to finance. Founded in 2015, Branch started operating in Kenya, where mobile money payment products such as Safaricom’s M-Pesa (which does not require a card or bank account to use) have scaled significantly. M-Pesa now has 25 million users, according to sector stats released by the Communications Authority of Kenya. Branch has more than 3 million customers and has processed 13 million loans and disbursed more than $350 million, according to company stats. Branch has one of the most downloaded fintech apps in Africa, per Google Play app numbers combined for Nigeria and Kenya, according to Flannery. Already profitable, Branch International expects to reach $100 million in revenues this year, with roughly 70 percent of that generated in Africa, according to Flannery. In addition to Visa and Foundation Capital, the $170 Series C round included participation from Branch’s existing investors Andreessen Horowitz, Trinity Ventures, Formation 8, the IFC, CreditEase and Victory Park, while adding new investors Greenspring, Foxhaven and B Capital. Branch last raised $70 million in 2018. The company’s overall VC haul and $100 million revenue peg register as pretty big numbers for a startup focused primarily on Africa. Pan-African e-commerce startup Jumia, which also announced its NYSE IPO last month, generated $140 million in revenue (without profitability) in 2018. Startups building financial technologies for Africa’s 1.2 billion population have gained the attention of investors. 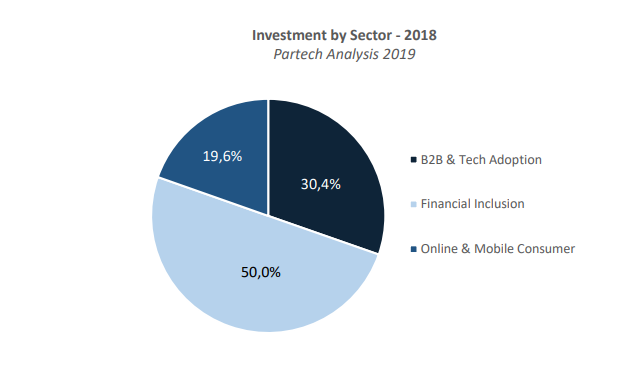 As a sector, fintech (or financial inclusion) attracted 50 percent of the estimated $1.1 billion funding to African startups in 2018, according to Partech. Branch’s recent round and plans to add countries internationally also tracks a trend of fintech-related products growing in Africa, then expanding outward. This includes M-Pesa, which generated big numbers in Kenya before operating in 10 countries around the world. Nigerian payments startup Paga announced its pending expansion in Asia and Mexico late last year. And payment services such as Kenya’s SimbaPay have also connected to global networks like China’s WeChat. B Capital, the VC firm from Facebook co-founder Eduardo Saverin, has made the first close of its second fund. The firm has closed out $406 million in initial capital, according to a filing lodged with the FCC last month. The document doesn’t include details of a target raise or which LPs have committed. Saverin came to prominence as a co-founder of Facebook, but he has rebuilt himself as an investor with a particular focus on Asia. B Capital is a relatively new entrant but already this new fund represents an upsized raise, even without the final close. B Capital’s first fund closed $360 million last February with consulting firm BCG a major backer from the get-go. The firm pitches itself as a bridge between the corporate world and quality startups, an area where its BCG alliance no doubt carries significant weight. The firm is based out of Southeast Asia — where Saverin has lived since renouncing his U.S. citizenship in 2011 — but it investors globally and has a San Francisco office. Its focus covers financial services, insurance, health, industrial, transportation and “consumer enablement.” To date, B Capital has invested in 19 startups, according to its website, and those include scooter startup Bird, insurance-focused CXA — which raised $25 million last month — Indian fintech startup Mswipe — which announced a $30 million round last week — and logistics firm NinjaVan. Saverin has also made investments via his family fund, Velos, but its involvement has tapered down since B Capital launched. 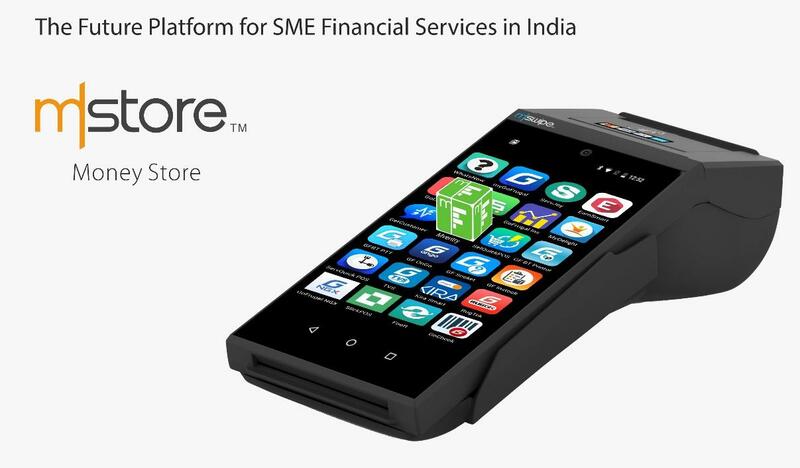 Mswipe, an Indian fintech company that develops point-of-sale terminals for merchants, has pulled $30 million in new funding as it bids to triple its reach to 1.5 million merchants over the next year. The company’s previous funding as a Series D in 2017 that ended up at just over $40 million, thanks to a $10 million extension from B Capital — the investment firm set up by Facebook co-founder Eduardo Saverin that’s backed by BCG. This time around, B Capital has provided the funding alongside other returning investors that include Falcon Edge, Epiq Capital and DSG Growth Partners. The deal takes the startup to $95 million raised to date. We wrote extensively about the company’s strategy back at the time of that 2017 round, and essentially the thesis is that POS devices remain essential despite the proliferation of new fintech like mobile wallets. 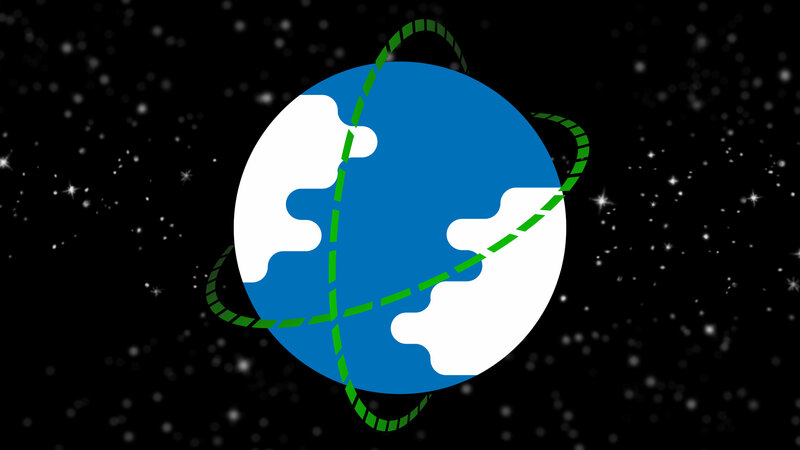 With that in mind, Mswipe makes its terminals cheaper than the competition while it can also work on more limited internet connections, even 2G, to help merchants and retailers in more remote areas or those on a modest budget. More critically, Mswipe CEO and founder Manish Patel believes the country is “ripe for disruption” because it has so few terminals. With less than three million terminals in operation across the whole of India, even Turkey, with a significantly smaller population of 80 million, has more. Right now, Mswipe claims to have reached over 400,000 merchants — up from 290,000 at the end of 2017 — and Patel said today that the aim is to grow that figure to 1.5 million over the next year. To reach that ambitious target, Mswipe is once again trying to put more than just a terminal inside a terminal. Beyond offering hardware that simply works and ties into newer types of payment, Mswipe has a vision of additional services for merchants. It is developing a new ‘smart’ POS — Wise POS Plus — that is developed on Android which allows applications like billing, inventory management and logistics to be pulled in, too. Indeed, the second piece to that is its own dedicated app store — MoneyStore — which is in development now and is aimed at housing a suite of productivity apps and related services for smaller retailers. “WisePOS Plus… powered by a suite of productivity apps, can enable a merchant to save thousands of rupees and hundreds of hours that go into running computer-based billing and inventory solutions with integrated payments. At the same time, we are also creating a huge opportunity for app developers with MoneyStore,” Patel said in a prepated statement. The second major prong that he believes can bring this growth is the adoption of UPI, the government-backed real-time payments system in India. Mswipe said it is “all set to enable” the system which will allow QR payments at terminals. Mswipe is also working with lending startup Cashe on a co-branded card for consumers following a deal announced in December. News just in: We’re getting reports the board of Krablr has voted overwhelmingly to jettison the sole remaining founder, Wilson Poney, and install an interim CFO to take the company in a new old direction. “No more ICOs, no more microdosing podcast retreats flirting with white supremacy. Just good, old clean business,” he added. Seamann, a former consultant with McKinsey, KPMG and OMFG, said the board believes the shell of the Krablr brand can still be salvaged — in spite of its disastrous ICO last year which saw an estimated $260M worth of ‘Krabcoin’ vanish without trace. The company is said to be in negotiations to offload its Krab.coin arm, developed specifically for the ICO, for a bargain price of around a dozen Dentacoins. It is also working to offload the assets of a previously developed messaging app to a “major social network” in order to extend its cash runway. No one has seen Poney for months either. “We believe there are exciting opportunities for Krablr to develop financial services for emerging markets — like offering loans to SMEs, as well as micro-insurance, cross-border remittance payments and other financial services to support those who are actually doing the fishing,” added Seamann. Australia-based Airwallex is the tech startup to enter the billion-dollar ‘unicorn club.’ The company announced today that it has closed a $100 million Series C round that values its business above $1 billion. 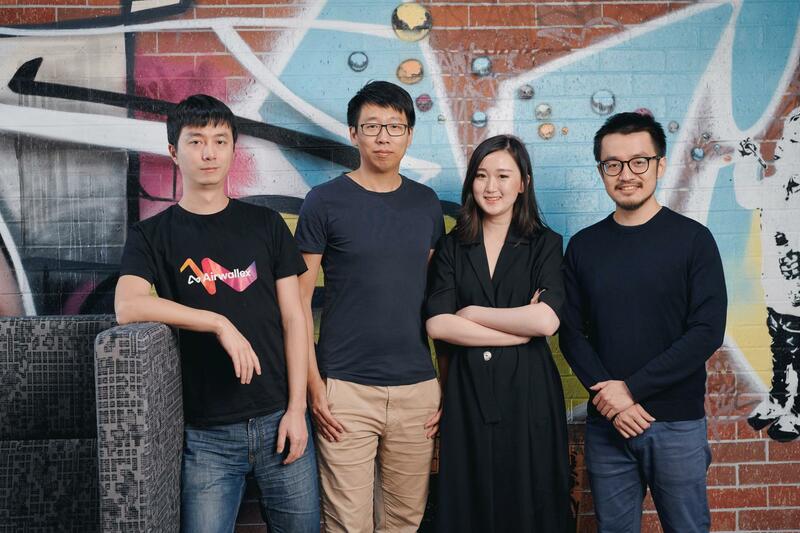 Started in Melbourne in 2015 by four Chinese founders, Airwallex provides a service that lets companies manage cross-border revenue and financing in their business much like consumer service TransferWise. Its customers can, for example, set up overseas bank accounts if they have paying customers overseas. When they want to move that revenue back to their HQ, they simply do so through the Airwallex system which uses inter-bank exchanges to trade forex at a mid-market rate. That’s something that can save its clients as much as 90 percent on their foreign exchange rates, and it massively simplifies the challenge of doing business overseas. This new round of funding is led by DST Global — the high profile investors that’s backed the likes of Facebook, Twitter, Spotify, Xiaomi and more — with participation from returning investors that include Sequoia China, Tencent, Hillhouse Capital, Gobi Partners, Horizons Ventures and Australia’s SquarePeg Capital. Airwallex has now raised over $200 million; its previous investment was an $80 million raise around nine months ago. Most impressively, the company has become a unicorn within three years of its launch — that’s an impressive feat, the company has come a long way since we wrote about its $3 million seed round in late 2016. CEO Jack Zhang told TechCrunch that the company is being public with its valuation for the first time because it provides a major validation that will help it build a reputation and develop additional services in the financial services space. “We talked to a number of global funds we found interesting but we picked DST because our biggest priority is international expansion and [the firm will] help us opening doors and going after larger opportunities,” Zhang said of the lead investor for the round. Indeed, the Airwallex vision has grown since that seed round. Today the company, which has eight offices worldwide and over 260 staff, has expanded its focus in terms of both customers and services. What does that mean exactly? Well, Zhang said Airwallex wants to be more than just a cross-border partner for companies. It already offers services like virtual bank accounts in 50 countries, it plugs in to partners to offer other financial services and its planned future products include credit card issuance to allow companies to manage money overseas with greater granular control. Indeed, already Airwallex has an internal team nicknamed ‘Alpha/ that helps SMEs and other businesses to grow overseas, while Zhang said it has made undisclosed investments in companies where it sees an aligned ‘global’ vision. The idea for the business came to Zhang, who spent time at Australia banks ANZ and NAB, after he grew frustrated of the challenges of importing overseas goods for a coffee business that he invested in with friends. Airwallex has fixed that problem for any would-be international-minded coffee shop owners/investors, but Zhang is convinced that the future of his business is to be an ecosystem for global banking and financial services. Precisely what that might mean in the future isn’t clear. But looking at companies that work closely with business customers, Airwallex is ideally placed to offer loans and financing, either directly or via partners, and really involve itself in growing its customers and their businesses. Airwallex is also casting its eye on banking licenses in selected markets, which could mean it returns to raise additional capital at the end of this year or the startup of 2020. Social investing and trading platform eToro announced that it has acquired Danish smart contract infrastructure provider Firmo for an undisclosed purchase price. Firmo’s platform enables exchanges to execute smart financial contracts across various assets, including crypto derivatives, and across all major blockchains. Firmo founder and CEO Dr. Omri Ross described the company’s mission as “…enabl[ing] our users to trade any asset globally with instant settlement by tokenizing assets and executing all essential trade processes on the blockchain.” Firmo’s only disclosed investment, according to data from Pitchbook, came in the form of a modest pre-seed round from the Copenhagen Fintech Lab accelerator. Firmo’s mission aligns well with that of eToro — which is equal parts trading platform, social network and educational resource for beginner investors — with the company having long communicated hopes of making the capital markets more open, transparent and accessible to all users and across all assets. By gobbling up Firmo, eToro will be able to accelerate its development of offerings for tokenized assets. The acquisition represents the latest step in eToro’s broader growth plan, which has ramped up as of late. Earlier in March, the company launched a crypto-only version of its platform in the US, as well as a multi-signature digital wallet where users can store, send and receive cryptocurrencies. The Firmo deal and eToro’s other expansion activities fit squarely into the company’s belief in the tokenization of assets and the immense, sector-defining opportunity that it creates. Etoro believes that asset tokenization and the movement of financial services onto the blockchain are all but inevitable and the company has employed the long-tailed strategy of investing heavily in related blockchain and crypto technologies despite the ongoing crypto winter. After the acquisition, Firmo will operate as an internal R&D arm within eToro focused on developing blockchain-oriented trade execution and the infrastructure behind the digital representation of tokenized assets. “The Firmo team has done ground-breaking work in developing practical applications for blockchain technology which will facilitate friction-less global trading,” said Assia. In its latest move beyond ride-hailing, Southeast Asia’s Grab has started to offer financing to SMEs and micro-insurance to its drivers. The launch comes just weeks after Grab raised $1.5 billion from the Vision Fund as part of a larger $5 billion Series H funding round that’ll be used to battle rival Go-Jek, which is vying with Grab to become the top on-demand app for Southeast Asia’s 600 million-plus consumers. Grab acquired Uber’s Southeast Asia business in 2018 and it has spent the past year or so pushing a ‘super app’ strategy. That’s essentially an effort to become a daily app for Southeast Asia and, beyond rides, it entails food delivery, payments and other services on demand. Financial services are also a significant chunk of that focus, and now Grab is switching on loans and micro-insurance for the first time. Initially, the first market is Singapore, but the plan is to expand to Southeast Asia’s five other major markets, Reuben Lai, who is senior managing director and co-head of Grab Financial, told TechCrunch on the sidelines of the Money20/20 conference in Singapore. Lai declined to provide a timeframe for the expansion. The company announced its launch into financial services last year and that, Lai confirmed, was a purely offline effort. Now the new financial products announced today will be available from within the Grab app itself. Grab is also planning to develop a ‘marketplace’ of financial products that will allow other financial organizations to promote services to its 130 million registered users. Grab doesn’t provide figures for its active user base. Grab announced a platform play last summer that allows selected partners to develop services that sit within its app. Some services have included grocery delivers from Happy Fresh, video streaming service Hooq, and health services from China’s Ping An. Motif, the startup using machine learning to develop investment strategies for consumers and institutional investors, and Goldman Sachs, one of the world’s leading investment banks, have launched new technology-driven indices to power a series of co-branded exchange traded funds. Walia says that Motif Investments is using data science and machine learning to build a better mousetrap for the financial services industry — and no less esteemed a financial services firm than Goldman Sachs has become the company’s first customer. There is one critical question that financial advisors who are developing new investment strategies need to consider, according to Walia. And that’s whether the index that a financial services firm is creating is diverse enough to take advantage of all of the opportunities a certain thematic investment strategy may present. To him, most strategies aren’t diversified enough, because they don’t include the breadth of public and proprietary research that Motif has scoured to create its indices. This morning, Motif and Goldman Sachs have launched a suite of five exchange traded funds based off of thematic trends that Goldman Sachs researchers identified as critical. “They gave us 25 innovations and we packaged them into five ETFs that have consistent relevance,” Walia says. The two companies will jointly market the products, which are focused on trends like artificial intelligence, big data, and cybersecurity; or the next manufacturing revolution, which includes companies developing robotics, new energy technologies, and three dimensional printing tools. Other funds will focus on the changing face of retail and the disruption of the healthcare industry, and even the ways in which technology is reshaping the financial services industry that Goldman has created. “What we’re trying to do collectively is, instead of guessing when to buy low and sell high, we are trying to predict what are the things that are going to happen in the future that are going to drive disproportionate earnings growth,” says Walia. Walia wouldn’t comment on the revenue split between the two companies, but said that there would be a share of the profits on the 0.5 percent annual management fee that Goldman is charging on assets invested in the fund. The new exchange traded funds will be available globally and are the first time that Motif will be investing thematically across all major markets rather than just in the U.S.
“Through these products we have access to eleven global markets,” Walia says. For Motif, the partnership tied together three trends in the financial services sector: the rise of passive investing, the collapse of the market for exchange traded funds thanks to their proliferation and popularity among investors; and finally, the growing numbers of Generation X (that’s me!) and millennial investors (that’s likely you!) in the customer base of the largest financial services firms. After 12 years spent investing in impact-oriented financial services startups around the globe, the Omidyar Network, which serves as the family investment office for eBay founder Pierre Omidyar, is spinning off its financial inclusion investment arm as Flourish Ventures. Equipped with up to $300 million in capital for operations and investments, the new Flourish will continue to invest around the Network’s core mission of backing companies with a dual focus of making a social impact and achieving quality financial returns. Already, the new firm is one of the most active financial services investors globally, according to a report from FT Partners. This double-bottom line approach has already yielded results for the company. “After 10 or 12 years with people becoming more broadly interested in the impact investment space, we had an opportunity to reinvent ourselves,” says Tilman Ehrbeck, a managing partner at the newly independent Flourish. Flourish is actually the third spin-out from Omidyar Network’s investment and philanthropic arms. Two years ago, Omidyar spun out its U.S. emerging technology initiative as Spero, and last year launched a governance and citizen engagement-focused group called Luminate. Now the organization, financed by Pam and Pierre Omidyar, will launch Flourish as the latest independent entity. “We feel that we are the right team at the right place at the right time,” says Ehrbeck. Flourish, he says, is launching into a financial services environment that looks far different than it did when the Omidyar Network first identified financial services and inclusion as a focus area for its operations. In the wake of the global financial crisis, financial services organizations indicated that they could not, or would not, deliver necessary access to consumers and small businesses. There was an erosion of trust, says Ehrbeck, and against a backdrop of stagnating wages and the changing nature of work, low and middle-income consumers and would-be entrepreneurs in emerging and established financial markets need all the help they can get. Indeed, an entire generation of entrepreneur is leveraging a slew of technologies, from blockchain to the platforms that Omidyar Network has helped create through its earliest investments in the market. That includes companies like Lenddo, an online lender using alternative sources of social media data to determine the creditworthiness of applicants raised its first institutional capital in 2012 with capital from investors, including the Omidyar Network. That investment and the company’s subsequent merger with another Omidyar Network company, EFL, is indicative of the formative role that Omidyar — and now Flourish — can play in the growth of a business. “We knew each other for three years. As we were looking to identify and scale we started to look at where there synergistic opportunities between smaller companies and could we put something together that would allow us to grow,” says Lenddo chief executive Richard Eldridge. That scaling has paid off in Lenddo’s expansion into more markets and a more robust product offering. Stories like those repeat across the Flourish portfolio of companies, and speak to the kind of value the company provides to portfolio companies, said Eldridge. 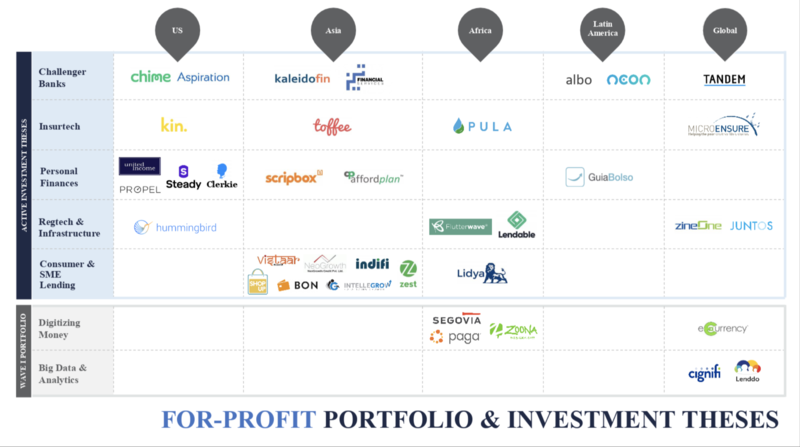 Indeed, Flourish’s global portfolio holds at least 40 fintech companies helping low and middle-income households and small businesses. From challenger banks like Chime, Aspiration, Neon, Albo and Tez; to insurance technology companies like MicroEnsure and Kin; and asset optimization tools, including United Income and Scripbox. Given the explosion of interest in financial services offerings across challenger banks and through insurance technology offerings, Ehrbeck said it was a no-brainer for the company to spin out, focus and potentially expand. With the spin-off, Flourish is taking the existent $200 million portfolio the team had built at Omidyar and expanding that with the additional capital commitment from the Omidyar Group. The firm is also starting to realize its first exits. The firm realized a 3x return on its investment in Asian Networks and has had another exit in the sale of Ruma to Go-Jek. Flourish will do more than commit capital to financial services startups. It also has the opportunity to provide grants and encourage research around financial inclusion. Some recent work from the firm included the financing of a study of 240 households called the U.S. Financial Diaries, which provided hard data around the illness that pervades a large swath of the U.S. population. Investments from Flourish will fall into similar buckets as the firm’s previous operations under the umbrella of the Omidyar Network. Including alternative credit, challenger banks, insurance technologies and low-cost digital infrastructures that can level the playing field for financial services providers. “We find a gap in the system and try to fill it and improve it,” says Arjuna Costa, another partner on the new Flourish team coming over from Omidyar’s financial services group. “We have the impact of companies scaling and reaching and serving people and led to replicators and competitors and widespread adoption,” Costa says. Lenddo and its credit-scoring business is a perfect example of the trend, according to Costa. As those companies gained traction and new customers, proving the market demand, Omidyar’s investments could scale to higher value offerings around financial services. Those higher value services are things like the agricultural lending business Rose Goslinga has launched for farmers in Africa. “We bootstrapped our business for the first two years. They were the largest investor in our seed round,” Goslinga says of the Flourish commitment to her company, Pula Advisors. “Omidyar is extremely well-known in the financial inclusion space. They had the first investment in micro-insurance 10 or 15 years ago. They are really seen as the blue chip of financial or insurtech investors,” Goslinga said. With their investment, it validated Goslinga’s attempt to provide credit and working capital loans to small farmers. In mature markets like the U.S., Flourish’s approach is bit more nuanced, to serve a market with significant inefficiencies and baseline inequality, but one where the disparities manifest in different ways. That’s why Flourish has gravitated toward businesses like Aspiration, which helps people bank more ethically — promoting sustainable investment portfolios and offering pay-your-own-fee for services; and Propel, which helps American consumers manage their public assistance benefits.